I decided to take a break from Wildstar and Destiny this weekend to give the Star Wars Battlefront beta a try. Being a Sci-Fi geek its pretty much a given that I’m a big Star Wars fan, and although I haven’t touched a battlefield game since Battlefield 3, I do have fond memories of that series of games, as well as the original Star Wars Battlefront and Battlefront II. October 9th, 2015 | Tags: 4k, Battlefield, Battlefield 3, Battlefield 4, Battlefield Series, Battlefront, Battlefront Series, beta, Dissapointment, EA Games, first person shooter, FPS, grinding, Lasers, micro-transactions, Origin, Star Wars, Star Wars: Battlefront. As Kris mentioned here in her article, we were lucky enough to get access to the Vermintide beta this week, something I personally was really looking forward too, as being a bit of a Warhammer fan, I’ve been looking forward to Vermintide since it was first announced. For those not in the know, Vermintide is a first person survival game set in the Warhammer classic universe, during an event called the End Times, the Warhammer worlds cataclysmic apocalypse. The short of it is the forces of chaos, thanks to their Everchosen, have started to invade the world, and are planning on wiping out everybody. Because Chaos. 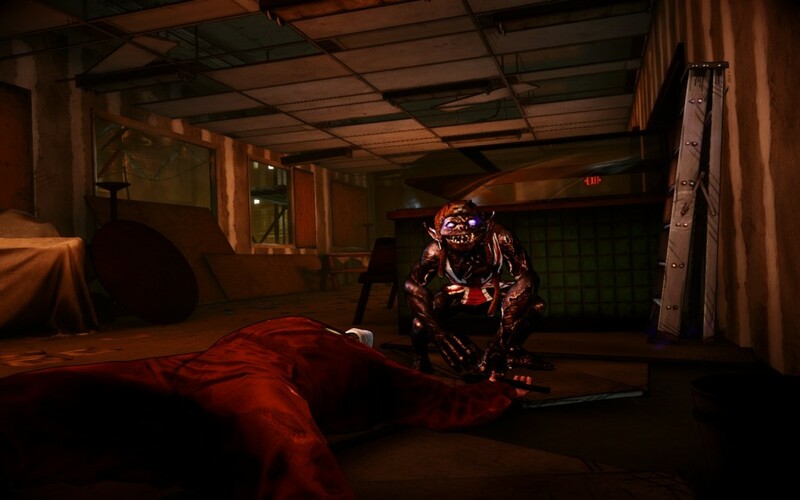 September 30th, 2015 | Tags: beta, Bright Wizard, Chaos, Dwarf Ranger, Empire Soldier, first person shooter, FPS, HUD, Left4Dead, preview, survival, Vermintide, Warhammer, Warhammer: End Times Vermintide. Trion Worlds‘ FPS MMO Defiance is to be released on the 2nd April! 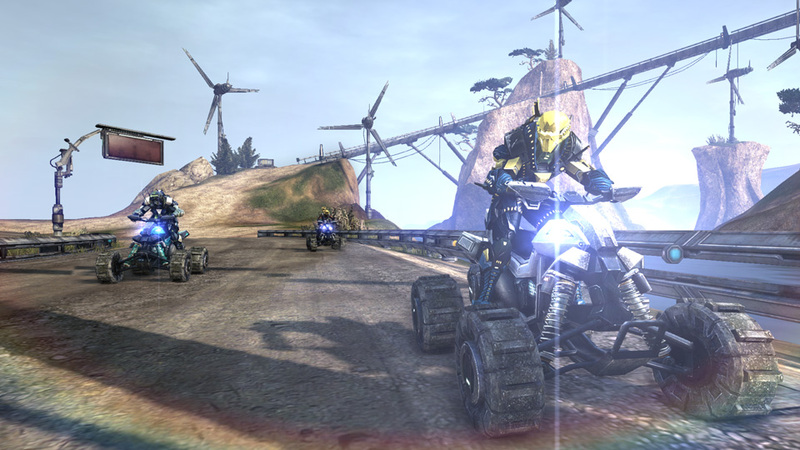 January 31st, 2013 | Tags: Defiance, DLC, DLC Season Pass, FPS, MMO, preorders, release date, Syfy, Trion Worlds. The Indie Royale have now re-released some of the greatest hits from previous Indie Royale bundles in the Replay Bundle Vol. 1..
January 8th, 2013 | Tags: 8 Bit Weapon Collection, adventure, bundle, Defense Grid: The Awakening, dungeon, FPS, Gemini Rue, Hidden Path Entertainment, indie games, InterWave Studios, MagicalTimeBean, Nuclear Dawn, RTS, The Indie Royale, The Replay Bundle Vol 1, Tower Defense, Wadjet Eye Games. PlanetSide 2 has now launched, and is available from the website, or on Steam. 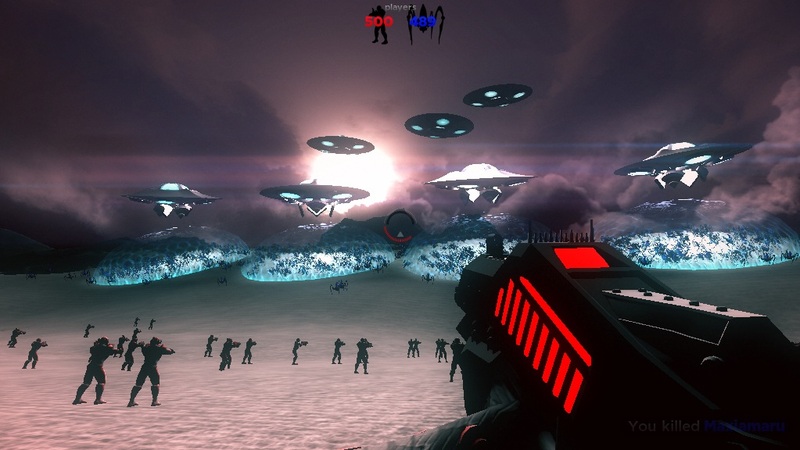 November 21st, 2012 | Tags: f2p, FPS, free to play, MMO, PlanetSide 2, skill trees. Firefall is a team-based shooter / MMO hybrid under development for the PC by Red 5 Studios; a studio founded by Mark Kern, former team lead for World of Warcraft. The game will be free-to-play once launched. To take part in the beta, sign up for an account: beta invites will be issued in waves. The game is set in a future Earth, where the promise of a new clean energy source leads to the arrival of a hostile energy storm called the Melding, that engulfs most of the world. A bloodthirsty race known as The Chosen has also emerged and threatens humanity’s survival..
Players can choose from three battleframes: assault, medic and recon, each of which can be customised with different weapons and loadouts. These are equipped by the player’s character, so you can switch between battleframes too. 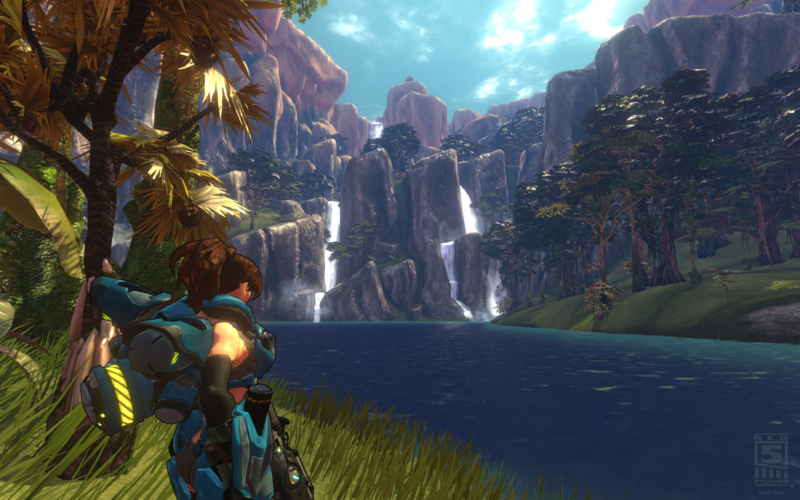 Firefall has both PvP objectives and cooperative PvE missions. PvP consists of Team Deathmatch, and a Sabotage game mode, which has teams take turns being on offense or defense, with three different points to capture and hold. Confirmed PvE missions so far include a Thumper mission, where players defend a mining machine against waves of enemy creatures while it gathers resources, and Rescue missions, for which no information has yet been released. Firefall has no set release date; as players join the beta and play, the team collect feedback and continue development of the game, with plans for the game to be rolled out ‘organically’, rather like Google’s Gmail service. February 10th, 2012 | Tags: battleframes, beta, Firefall, FPS, free to play, hybrid, missions, MMO, PvE, PvP, Red 5 Studios, Sabotage, Team Deathmatch, World of Warcraft. This week, the demo for The Darkness II, by Digital Extremes and 2K Games, was released on Steam, Xbox LIVE, and later, the PlayStation Network. Player-character Jackie Estacado is the don of a crime family, as well as the owner of a demonic power called The Darkness. After the death of his girlfriend, Jackie has tried to control The Darkness.. but it wants out! Jackie is also being hunted by others who want The Darkness for themselves, and the demo starts with a scene of Jackie being crucified and beaten in order to try and force him to give up his powers of his own free will.. Earlier events have Jackie going to a restaurant and meeting some girls before one of them is shot and a car rams its way through the wall, crushing Jackie’s leg and foot. This results in Jackie himself having to be dragged away by a henchman while he shoots the enemies who have come to capture him.. This bit was on rails, but I found the shooting fun, with plenty of enemies appearing from all around. 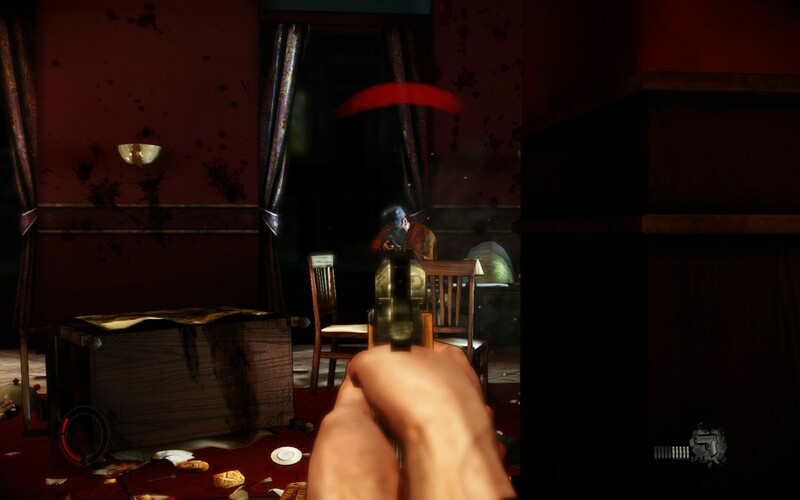 One of the new features of this game is quad-wielding: Jackie can use firearms while still manifesting powerful demon arms, unlike in the previous game where you used either The Darkness or guns. There are also bonus points for different executions.. and lifting an enemy into the air with one arm and then splitting them in two with the other does feel rather powerful! 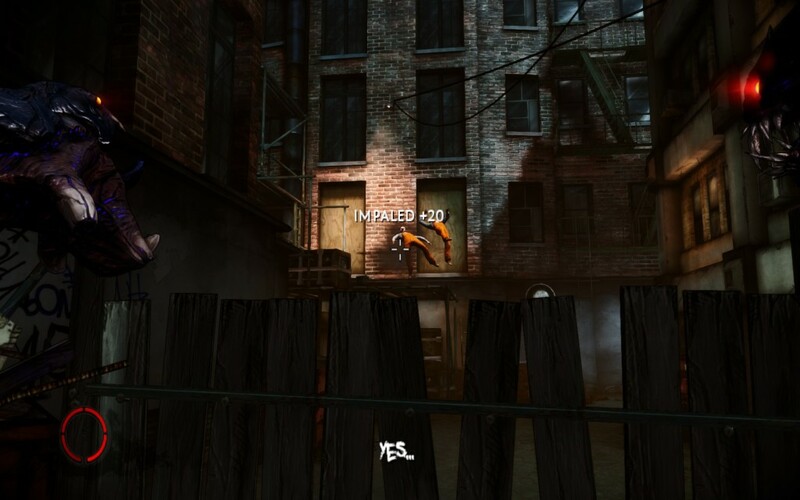 Once out into the street, car doors can be torn off and used as a shield while you shoot it out, or you can throw the door itself at them if you prefer. All these abilities are available via different buttons on the keyboard or mouse, and while this saved me from having to switch between active abilities, I found the use of middle-click strange and slightly uncomfortable. 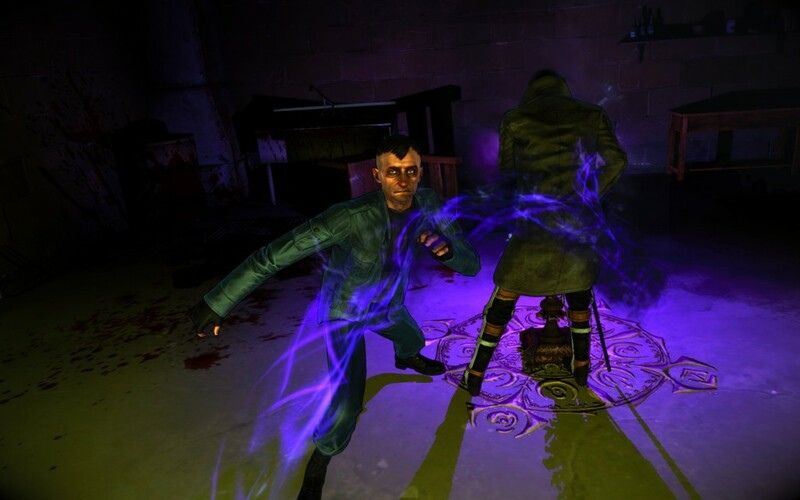 In the first Darkness game, there were a range of Darkling types with their own unique abilities: Beserker, Gunner, Kamikaze and Lightkiller. In this game there is just one Darkling with some importance to the story and gameplay. He is able to help out in fights, interact with the environment around him, and scout out areas for Jackie.. more of an ally than expendable minion this time. Certainly, he is rather unique.. as well as having an affected British accent, he’s wearing a Union Jack for a jumper and has a dead cat on his head..
January 29th, 2012 | Tags: Darkling, demon arms, FPS, Jackie Estacado, powers, The Darkness, The Darkness II. Man vs Machine is a browser-based FPS, designed as a world-record attempt and tech demo by MuchDifferent. The aim is for 1000 players to simultaneously battle it out as either Man or Machine: Man is equipped with an explosive projectile dealing splash damage, whilst Machine uses piercing, precision lasers to deal damage to single targets. First up, the main site was unable to take the strain, and had a Google redirect slapped on it. I found a mirror; a page with unstyled CSS but most importantly, the option to get in and play. I managed to get in (as Man) long enough to see a mass of machines under shields on the horizon.. I fired a shot or two before the connection dropped.. I got one kill, anyway. I reconnected, and was placed on the side of the Machines where I was killed as soon as spawn-protection was over. This happened over and over, and I don’t think I even killed a single enemy. Man has splash damage, meaning they only needed to keep firing in the direction of the Machines to guarantee a kill, while Machines have to wait for the shield to disappear before firing, find a target and aim.. and then hope to hit something. Machines are bunched up in groups, there is no cover, and nowhere to run out from to try and flank the humans. I feel the Machine’s model is too large as well, as your allies all-too-effectively block your view of the enemy. A larger map might allow players to get out and move around, and let this be a bit more fun. Sure, this is a world-record attempt and tech demo – but this wasn’t even close to fun to play as a Machine. January 29th, 2012 | Tags: browser-based FPS, FPS, Man vs Machine, MuchDifferent, tech demo, Unity, world record attempt.